Henry Cavill News: New Super Suit for Henry? + The Best Autograph & The Man of Steel is One Popular Brit! New Super Suit for Henry? + The Best Autograph & The Man of Steel is One Popular Brit! UPDATE: This just in tonight..
BATMAN VS. SUPERMAN has opened a production office at Raleigh Michigan Studios in Pontiac. Patrick Tatopoulos on as Production Designer. Henry has been pulling double duty in London, as he films The Man from U.N.C.L.E. while working out for the Man of Steel sequel. And as the official start of production gets closer (we had some filming in L.A.), the news and rumors are increasing. Here's a little wrap to get you caught up. 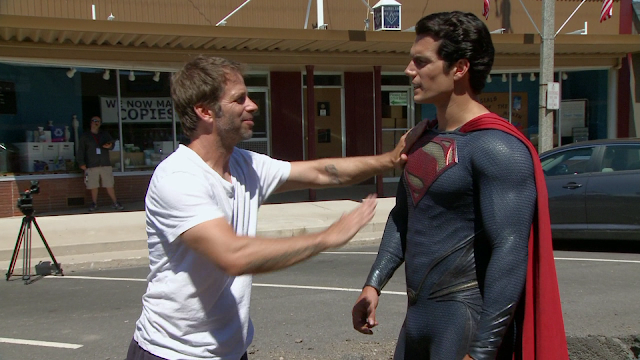 Behind the scenes cap from the Man of Steel Blu-ray. Check them ALL out. First off, The People's Choice Awards are now taking votes that will determine the nominees in 54 categories, and Henry & Man of Steel have made the pre-list in three of them. You can vote for them in Favorite Movie, Favorite Action Movie, and for Favorite Action Movie Star. You can also write-Henry in as a nominee for Favorite Movie Actor. The official nominees will be announced November 5th. So let's get those final votes in before Thursday October 31st. The poll will close at 11:59 PM, EDT. The People’s Choice Awards air Jan. 8 at 9 p.m. EST on CBS. VOTE FOR HENRY NOW. The main reason we enjoy supporting Henry, is because of moments like these. Steven and his friend Adam met him as he stopped by 'The Katie Show' while promoting Man of Steel. Read more about their experience. And how cute is THIS??!! misstashaevans: Aww my little nephew Kallel got an autograph from Henry Cavill. When you see those pictures and read the fan stories, it's not hard to see why Henry comes in at #24 (behind Daniel Radcliffe and ahead of former Batman Christian Bale) as one of the most popular Brits in the U.S. That's according to The Sunday Times. Check out who else is included and how the survey was compiled. Who would you want beside you during a devastating blackout? While Ben Affleck is gearing up to play Batman in the Superman sequel, it's still the Man of Steel himself (played in this summer's blockbuster by Henry Cavill) who is the superhero most trusted by more than half the nation (52%) to protect the U.S. in case of a catastrophic blackout. Surprisingly, Americans have little faith in the abilities of seemingly more tech savvy and ingenious engineer Tony Stark to get the power grid back online, as Ironman comes in at a distant second (14%). My source tells me that Henry Cavill just received a copy of David Goyer's script last week, and that you can expect alterations to Superman's costume, as there are "two separate teams working on the suits." Uhmm.. Zack.. do NOT mess up the gorgeous. Please and thank you. They throw in some tidbits on Ben's costume, as well as more on the alleged design of the new Batmobile. Read the rest. And the Man of Steel official twitter posted a pic of this cool prop a few days ago. But is it meant to be more of a teaser? we can't wait for more news to come out on the sequel! 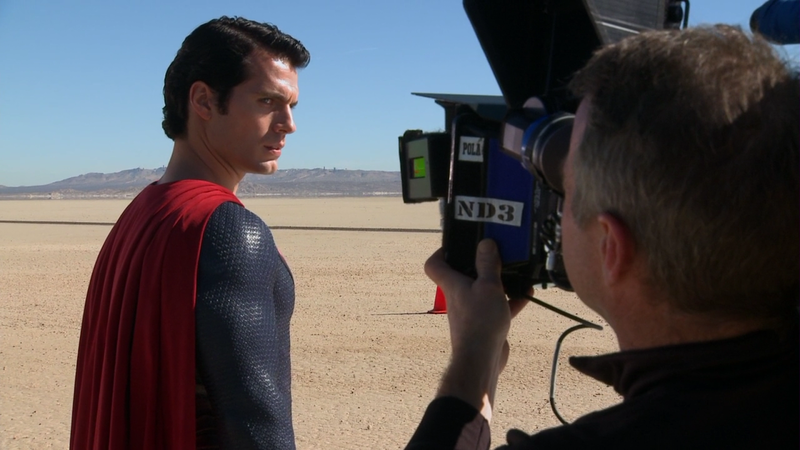 In the meantime, the U.S. release of the Man of Steel Blu-ray/DVD is getting closer. And just looking at the behind the scenes promo videos, we are counting down the seconds until we have it in our hands. Here are the list of places where you can buy it, & read about the extras it comes with. Finally, probably the BEST ever tribute to the Man of Steel on a football field, courtesy of one talented Ohio State University Marching Band (starts at about the 1:00 mark). More SUPER news to come!